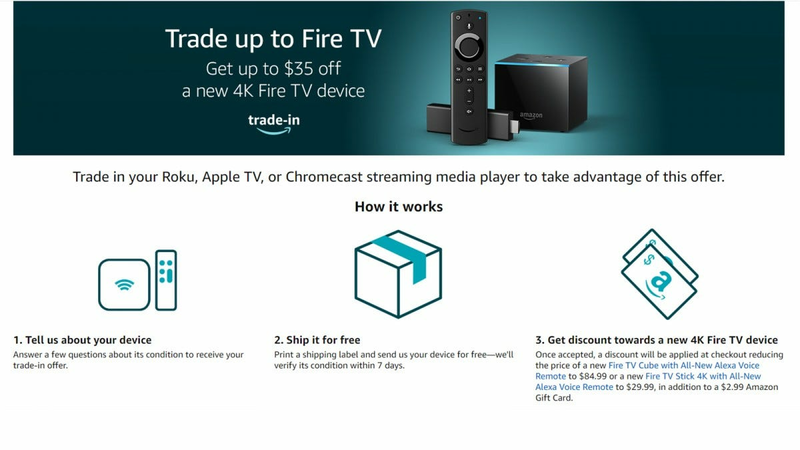 Amazon’s new 4K Fire Stick is already an incredible value at $50, but if you’re looking to pull the trigger on an upgrade you could save yourself and additional $20 by trading in your existing box. It’s a pretty simple setup: you tell Amazon about your device, get a shipping label, then send it over to them. Once it’s received, you’ll get a $20 credit towards your new Fire TV Stick (or $35 towards a Cube if that’s your preference). They’ll also throw in a $2.99 Amazon gift card just because. As you go through the trade-in process, the value will show up as $2.99 for basically all devices—that’s for the gift card you’ll be getting. Otherwise, it appears you get the $20 off a 4K Stick or $35 off a Cube regardless of the device, whether it includes all the extras (remotes, etc. ), or if it’s even functional. All Roku, Apple TV, and Google Chromecast devices are eligible for trade-in, including devices that no longer work. So if you have an extra box tucked away in the closet, it’s time to break that joker out and swap it for a brand new, working Fire TV. That’s awesome. Hit the button below to get started.